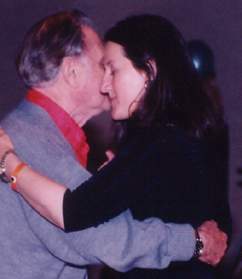 In 1985 Sylvia and Jonathan Bixby co-founded the Santa Barbara Swing Dance Club, a twice-monthly live-music dance club that they continue to run. She is still teaching her weekly classes that she started teaching in 1979, plus she teaches out of town over forty weekends per year. Her dance troupe ran for fifteen years, performed with some of the great Swing bands, and nurtured other International teachers. She has been a member of the Santa Barbara Dance Alliance since its inception, has taught at the University of California, and has appeared in many TV shows and in several documentaries on Swing dancing over the years. Sylvia is actively judging and teaching various forms of Shag, Balboa, Lindy Hop, and West Coast Swing throughout the U.S., Europe, Australia, and Asia. She is still an active competitor and she has won or placed in virtually every Swing event she has entered, in a multitude of Swing forums.